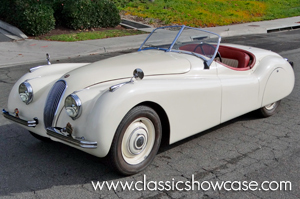 Classic Showcase is pleased to offer one of the rarest classic Jaguars available in the world today, the Alloy-bodied XK-120 Roadster. 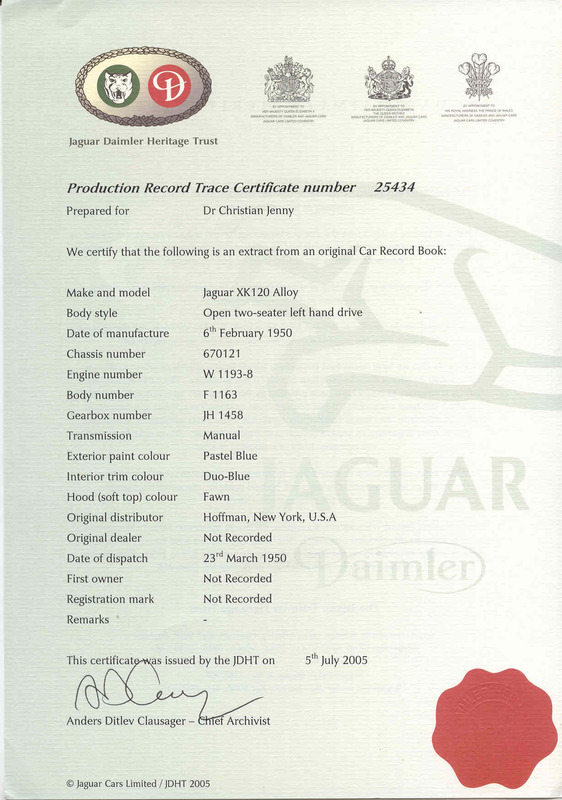 The car offered here, chassis number 670121, is one of the hundred eighty-four delivered with left-hand drive, out of a total of 242 Alloy-bodied cars produced. A nice example of the rarest of all early patterned Aluminum bodied cars with steel disc wheels, and distinctive rear mudguard spats. This example stands as a wonderful example of the archetypal and most desirable of the Alloy-bodies series of cars, and presents the Jaguar collector with a rarely afforded opportunity to own a coveted piece of Jaguar motor history. While most contemporary observers of the Jaguar XK120 would be certain that it was born for greatness, it is surprising to consider that it was conceived and born as a limited-edition stopgap model. William Lyons assumed that the post-WWII fortune of his company, the recently re-named Jaguar Cars Ltd., would be made on the saloon cars that would sell so well in export markets, especially in the U.S. To that end, a new dual overhead-cam, six-cylinder, 160 horsepower engine was developed to power a new luxury sports four-door. As the new car was not yet ready, it was decided to launch the engine in a limited run of alloy-bodied roadsters. When shown at the 1948 Earl’s Court Motor Show, it created a sensation. Following a speed run on a Belgian highway in 1949, in which an XK120 ran 126 mph with its windshield on and 132 mph without, there was no doubt that this would become a regular production model. After 240 alloy cars were built, production was shifted to more easily manageable steel, which was now more widely available following post-war material shortages.